The Medical Humanities Reading Group has a Guest Speaker on Tuesday 31st January. 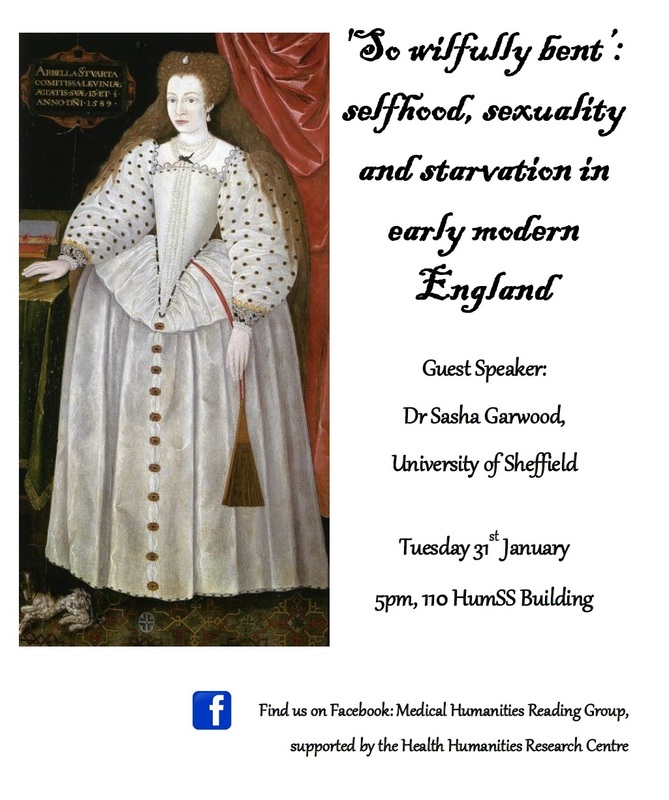 Dr Sasha Garwood-Lloyd will be talking about sexuality, starvation and selfhood in Early Modern England. Sasha’s research focuses on female self-starvation during the early modern period, and its precise differentiation from the contemporary phenomenon of eating disorders. This talk is drawn from her forthcoming monograph Early Modern Noblewomen and Self-Starvation: the skull beneath the skin due out March 2018 from Routledge. This will be a 30 minute presentation, followed by the opportunity for questions, in HumSS 110, starting at 5pm Tuesday 31st Jan. No need to register, and snacks will be provided to prevent modern starvation too! This entry was posted in Department of English Literature news and events and tagged Department of English, Department of English Literature, English Department, English Literature, Evan Hayles Gledhill, Medical Humanities Reading Group, Reading, Sasha Garwood- Lloyd, University of Reading. Bookmark the permalink.